I’m not a huge grind guy, but when the aesthetic is tempered a bit, I can appreciate it. Cognizant are a really solid example of that; with a self-titled album that explodes over the course of just 17 minutes, they weave a chaotic web of death, black and grind elements with relentless intensity and slick production. The result is simultaneously viciously aggressive and eminently listenable. This album took me by surprise with its high quality and unique niche. 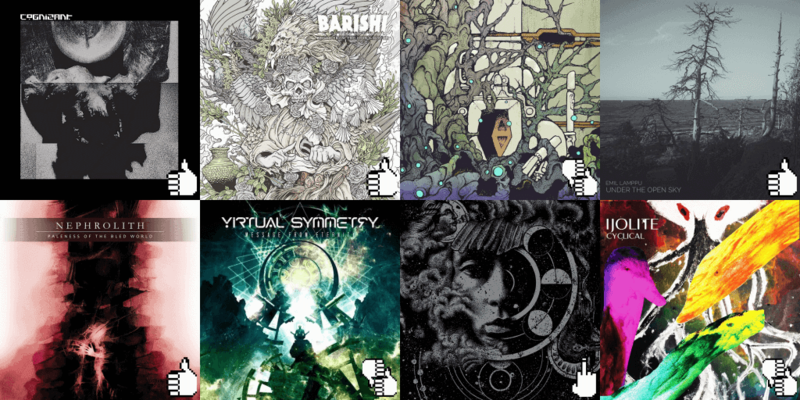 I highlighted a couple of bands that could be considered progressive post-metal/sludge in my last set of mini-reviews, but Barishi actualize an even better representation of this style, with outstanding production value and extremely creative musical structures. The guitars have a beautiful balance of thick heaviness and stark, crisp tones when they aren’t chugging along. The drums and bass nestle in perfectly, for a warm, round sonic experience. Highly recommended. Slomatics are part of a current wave of thick-guitar-tone, balls-heavy nu-doom bands (see also Conan, Monolord, Yob), and while I tend to favor funeral doom over stonery-sludgy doom, I find this album a lot more appealing than its counterparts. Their soaring-yell vocal style will be offputting to some, but it works for me and makes this worth an occasional listen. I mean, just check out those harmonies on ‘Super Nothing’ – few balls-heavy bands have the balls to pull that off. I said before that I’m not a huge grind guy…well, I’m even less of a djent guy. I don’t like djent, I don’t like the djent-adjacent nu-prog of acts like Plini and Sithu Aye, and I don’t like how much attention they get. Now, with that crotchety-old-man rant out of the way – here’s the rare exception to my vitriol! Emil Lamppu offers a surprising blend of styles, keeping things grounded in more traditional prog while building with the tools of the modern melodic prog wave. The drums are programmed, which affords him the opportunity to be a little cheeky with his shocking twist in the middle of opening track ‘Arrival’. But everything else is gorgeous – really creative melodies, wide array of instruments and sounds, great technique. Nephrolith, whose named I mistyped 17 times before spelling it correctly, put an emotionally intense twist on modern atmospheric post-black metal. This album, their first in five years, is a major leap in quality over their past material. The vocals are a strained, desperate yell that is pretty unique within this style, and the supporting instrumentation is solid though not groundbreaking. I love the artwork for this release, and I also love the humorous double meaning of “Bled” in the title, as the band hails from the city of Bled, Slovenia. Virtual Symmetry suffer from the symptoms of being prog that doesn’t progress; they’re perfectly mediocre, cookie-cutter power-prog strongly reminiscent of Anubis Gate. The music is melodic and straightforward, with lovely nuanced keyboard performances, but does nothing to distinguish itself. The highlight is the mandatory epic closing title track, ‘Message from Eternity’, a 23-minute encapsulation of their sound that also incorporates some saxophone and a very powerful vocal climax in the middle before an expansive instrumental outro. Everything about Bhavachakra‘s album makes me want to like it…except for how it actually sounds, which, in music, is kind of an important detail. Creative, high-concept black metal sounds like a winner every time, but sloppy performances, questionable riff melodies, and modest production value turn me off from this band, who sound something like a slightly less hipster Liturgy. A clash of interests for me here; I’m a sucker for anything elemental, but shy away from anything instrumental. Ijolite confronts me with a giant slab of vocal-free post-metal with an underlying concept of earth-fire-water-dark-light and vibrant, attractive cover art. I decided to give it a fair shot, and while it is a pleasant, diverse listen, there are no breathtaking, knock-your-socks-off moments. There are moments of more ambient post-rock, and moments that veer into somewhat blackened territory (never quite “black metal” per se), with style variations roughly following the elemental progression. Production is pretty lo-fi but doesn’t detract much from the music, except the heavier parts would sound nice being a little bit beefed up. Nice album to have on in the background, but won’t make anyone’s year-end top 10 list. On	September 14 2016, this entry was posted.